ww2dbaseYahagi was the second of four Agano-class light cruisers. She was completed at Sasebo, Japan at the end of 1943, and was immediately deployed to Singapore for training and patrols under the command of Captain Matake Yoshimura. 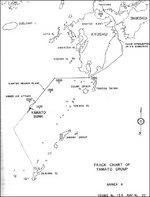 In May 1944, she joined carriers Taiho, Zuikaku, Shokaku, and an array of other ships for an offensive in the Mariana Islands. The resulting engagement, the Battle of the Philippine Sea of 13 Jun 1944, in which battle Yahagi and destroyer Urakaze together rescued 570 men from the torpedoed Shokaku. Between Jun and Jul 1944, she was drydocked at Kure, Japan for refitting; she received two additional triple-mount Type 96 25-mm anti-aircraft guns, a Type 13 air search radar, and a Type 22 surface search radar. On 8 Jul 1944, she departed Kure with a number of other battleships, cruisers, and destroyers for Singapore. On 24 Oct 1944, she participated in the Battle of the Sibuyan Sea, and on the following day the Battle off Samar; she was not damaged in the two battles in the Leyte Campaign and returned to Brunei. On 16 Nov 1944, Yahagi became the flagship of Rear Admiral Komura Keizo's new Destroyer Squadron 2. Between Dec 1944 and Mar 1945, she was in Japan for refitting; during which time, Captain Tameichi Hara took over command on 20 Dec 1944. On 6 Apr, she departed with battleship Yamato for Operation Ten-Go against the American forces off Okinawa. At 1220 on 7 Apr, the attacking force was attacked by 386 American aircraft in several waves, and a torpedo hit at 1246 in the engine room left her dead in the water. She was hit by at least six more torpedoes and 12 bombs before she capsized at 1405. 445 men were lost in her sinking; Captain Hara and Rear Admiral Komura survived. 29 Dec 1943 Yahagi was commissioned into service.